1.5 Who should have an echo? Echocardiography (echo), the use of ultrasound to examine the heart, is a powerful and safe technique which is now widely available for cardiovascular investigation. This simple and highly praised text is a practical and clinically useful introduction to the subject. 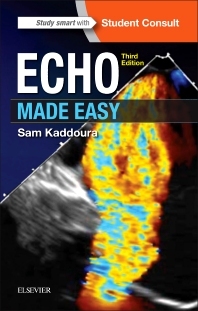 It aims to explain the echo techniques available, outlines what they are most suitable for, and most importantly puts echo into a clinical perspective. This book will be of value to all those who use or request echo, particularly doctors in training and medical students, but also physicians, surgeons, general practitioners, technicians, nurses and paramedics. This Third Edition takes full account of recent advances in echocardiography. A new chapter on performing and reporting an echo has been added. New text has been added on the role of echo in individuals with cancer and in diseases of the aorta. There are updated and expanded sections on pregnancy, the continuity equation, diastolic function, long-axis function and 3-D echo. There are also updates and more detailed sections on the use of echo in emergency situations, in cardiomyopathies and pericardial diseases, in congenital abnormalities and in cardiac resynchronization therapy. Up-to-date published international guidelines have been referenced throughout. New online content is available in the form of echo video images with accompanying self-assessment questions which will allow the reader to carry out self-assessment of knowledge and to see examples of the echos described in the text.